ScotchJohn 2 months, 1 week ago. Sometimes, I become confused as to the time of posts on AW. I’m transferring from WSL, which had a time zone adjustment feature to the actual time zone of my machine. However, I’m assuming that everything on AW is set to CST, GMT -6. Between friends, family, and the folks at AW, we are spread across the globe. I started using an extension called FoxClocks, that lets me set up desired time zones in my status bar, so I can quickly see, not only the time, but the actual day that it is for the person/persons I’m trying to communicate with. There was a time that I could quickly figure out these things, no problem… sigh… but at least, now, I just take a quick glance… and it does help me figure out the AskWoody time difference for me. For the global community if by the minute precision is needed. In the past the server has observed the US Central Time Zone Daylight Savings Time offset. Presuming this continues, this year on Sunday 10 March at 0800UTC, server time will move from UTC-6 to UTC-5. Elly – thanks. We have lived in CST, but have been back in GMT since the turn of the century, and have to make the adjustment manually. Yes, I have the FoxClocks add-on for Firefox; Andy McDonald has done a nice job with this add-on. I just wanted to make sure that I had not missed anything. I use the Windows clock for that, I currently show 3 times i need to know for US, Eu & Australia. 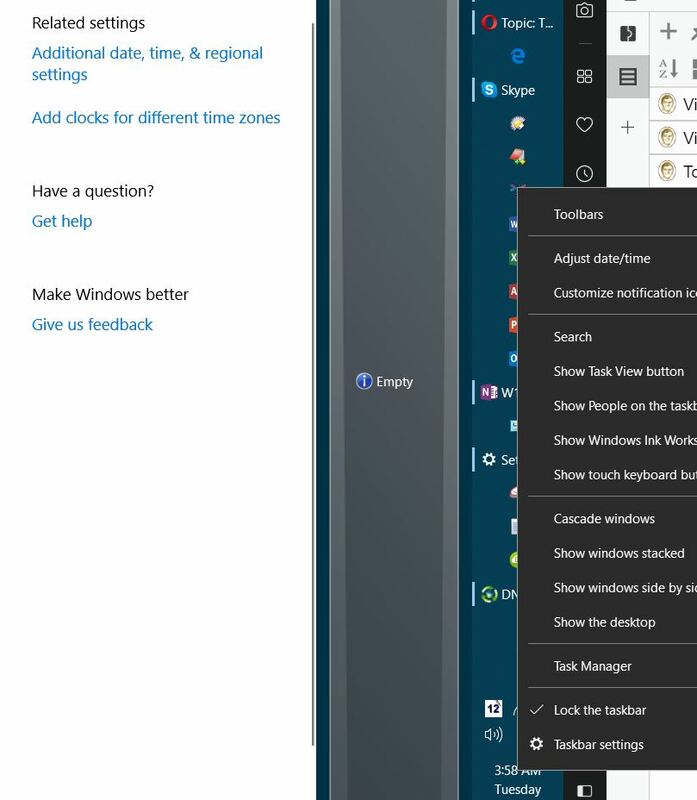 In Date & Time window, on the right side click ‘Add clocks for different time zones’. Similarly, mine shows US Central Time, London and Kathmandu. The Windows Clock is limited to three time zones… and on my Windows 7 I have to hover to see any but my time. It is there when I glance, and gives a more colorful and detailed view. It can be customized… and allows for more than two additional time zones (I’m showing you three). Btw it’s the same on Win10, 3 zones limit. Of course, I had forgotten about Windows Clock, where I already had three time zones set, UK, still a single time zone, though the jury might be out on this, US Central, and Melbourne (my best man), which changes on odd dates that take me by surprise. Now, of course, having such a useful tool means that MS might deprecate it in the next update. Just wait!